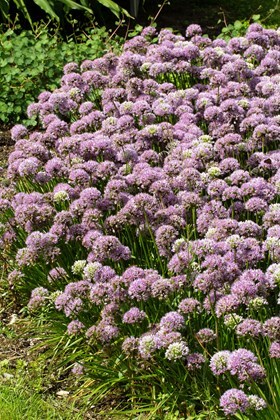 The more typical and familiar bulbous Alliums were planted in the autumn and will have spent the winter growing roots and readying themselves to flower in the late spring. These spring planted forms have no real bulb and are more herbaceous in their appearance and flower later in the summer so they can be divided and replanted safely both in the spring. Sun lovers, as are nearly all Alliums and a magnet for the insects on a warm day.